This time last week the Naifaru Juvenile team was feeling very exhausted, but delighted, after a mid-week event that was set to make our Marine Centre’s year. We were being visited by Amway Europe – one of the world’s largest direct selling companies, operating in more than 80 countries and territories. 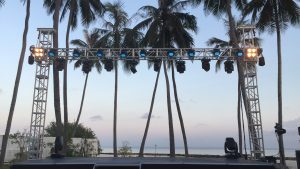 The company rewards its top sellers or ABOs (Amway Business Owners) every year by taking them to far flung exotic places to relax, unwind, socialise and celebrate. 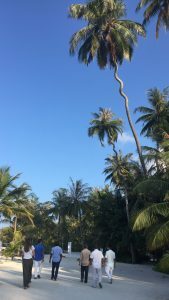 Naturally they chose The Maldives as a place to do this, especially as these ABOs were no ordinary ABOs – these guys were the cream of the crop and included Amway’s Diamond Club. 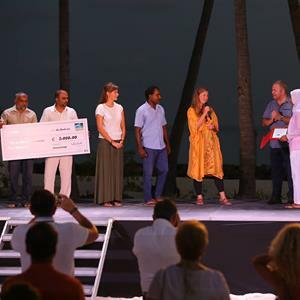 To host these high-achievers only the best would do, so this year the company took over the 5 star luxury resort Atmosphere Kanifushi, voted by multiple publications, such as The Daily Telegraph and AOL UK, as one of the best All Inclusive Resorts in the World. When we were first visited by the wonderful team at Atmosphere we learnt about Amway’s compelling CSR track record – how they actively took an interest in the countries they visited – they did not want to fly in, fly out and never truly know the place they visit. True to their value of Integrity and Partnership, Amway always look for a way to add some value to the lives of the local people. They didn’t have to search long before they found the Atoll Marine Centre, which focuses on Turtle Rehabilitation and Marine Conservation. On March 8th, our Atoll Volunteers guided Amway guests through Naifaru to some much-needed refreshments down on Turtle Beach, on what felt like one of the hottest days of the year so far. They were then able to enjoy a presentation from Marine Biologist volunteer Zoe, who explained what we do on a daily, weekly & monthly basis, as well as the challenges faced by The Maldives, Naifaru & our NGO when it comes to protecting the turtles and trying to keep our marine environment healthy and happy for all. Of course the main event for these engaged and enthusiastic guests was taking a tour of the Marine Centre and seeing up close our family of 43 turtles. What a pleasure to host guests who were genuinely motivated by the plight of the turtles and who cared so deeply about marine conservation! It wasn’t long before we were able to see these new-found friends again, as representatives from Atoll Marine Centre and Naifaru Juvenile were soon whisked off to Kanifushi to meet Bob Postins, Head of Travel & Special Event’s, and learn more about a donation we were set to receive at Amway’s annual Diamond Club Awards Ceremony that night. 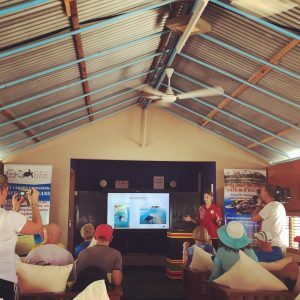 Bob also told us that our Atoll Marine Centre away day was the most highly attended CSR activity they had ever had and that the guests had not stopped talking about their experience since their return. This was great to hear, and to talk with him about the broader work of our NGO was an absolute delight. He understood our cause and welcomed us into the family that is Amway. After more meeting, greeting and canape-eating, in what must be the most glamourous and stunning setting, we soon came to the part we had all been waiting for – the cheque-giving ceremony! We were blown away to discover, on stage, that we would be receiving 3,000 euros! 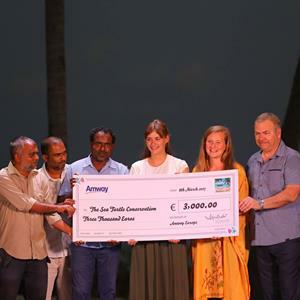 This extremely generous donation means we can finally implement our Satellite Tagging programme as well as build a small operating theatre to perform minor surgeries for injured and rescued turtles – much needed of late. When we learnt that Amway’s vision was simple – to work each and every day to help people live better lives – we knew we had found a partner akin to us, who we could trust and take inspiration from. Thank you Amway – from the bottom of the ocean in our hearts – you have helped make a difference to our work at the Marine Centre and we will be forever grateful! We hope to see you return to The Maldives and continue the story with us.